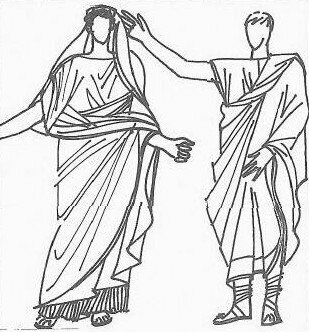 the clothing of Ancient Rome was composed of a tunica (shirt; a simple woollen sleeveless garment in the shape of a large oval), and a toga (a white, woollen coat in the shape of an ellipse, which was approx. 3.5 m wide and 5.5 m long). The women's tunica was longer than the men's. These folded, unsewn garments provided a basis for more individual wear, as they could be adjusted in a different way each time they were worn.